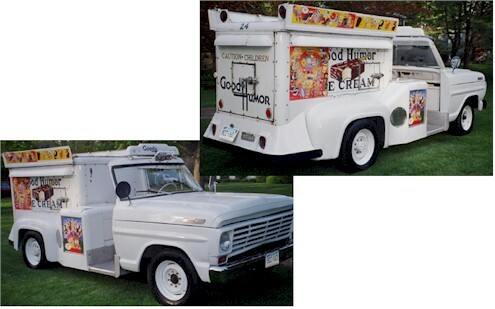 There was just one "Good Humor Ice Cream Truck" working our part of town and on days when in was working somewhere else, the slack would be taken up by a guy peddaling a freezer bike. These were alot more kid friendly. Parents didn't have to worry about their kids being run over by the "Good Humor Man". When I was growing up, there was the 'Good Humor' truck and an independant guy by the name of 'Bert's'. Bert always had different items on his truck. In later years, there was a 'ding dong' like sound running the streets. That turned out to be, 'Tropical Treat'. Sort of a lemonade and other fruit slush. Something like you might see on a carribbean island somewhere. When the Good Humor truck came on the block it was, "It's the Good Humor man!" But when the Bungalow Bar truck came around it was, "HEY, BUNGY!!" Sticking my head in the freezer door on a blistering summer day (ahhh! ), and being allowed to ring the bells! Q: Why do they play the music so loud on those ice cream trucks? A: To muffle the screams. Yep, remember the jingling of the Good Humor bells very well in my Queens neighborhood growing up. It was much more pleasant than that Mr. Softee jingle, which I detest.